Anatomy of my recent Virginia marijuana cultivation trial victory | Jon Katz, P.C. Many medical marijuana users grow multiple marijuana plants to assure an uninterrupted supply of quality medicine. When one is prosecuted for growing multiple marijuana plants in the jurisdictions where I practice (where only Maryland has an affirmative medical marijuana defense among the jurisdictions where I practice, but only for an ounce and below), a simple possession conviction often is a victory in such prosecutions. By now, I have defended several marijuana cultivation cases, all of them including a medical marijuana defense that the only crime involved was simple misdemeanor marijuana possession. Beyond the misdemeanor victory listed below, I have blogged about obtaining a Maryland medical marijuana sentence on multiple plants (before medical marijuana became an affirmative defense in Maryland for one ounce and below), and converting a 40-plant Virginia felony charge to a half-ounce possession with intent to distribute misdemeanor. In a recent medical marijuana cultivation victory (past victories of course cannot guarantee future results), I ultimately convinced a judge in a Virginia felony cultivation marijuana prosecution — where both sides agreed to waive a jury — that the dozens of plants involved in the case merited only a simple misdemeanor marijuana conviction. In this case, the police raided a house on a search warrant and found several dozen marijuana plants inside, both mature and immature plants. The house’s owner was arrested, and implicated my client as growing along with him. We presented testimony and evidence that my client was growing to see if he could be successful at it in order for him to consider applying to open a lawful dispensary in a medical marijuana state. For that reason, several different strains and plants were grown. He testified that he uses marijuana medicinally related to his diabetes, and that he did not share the grown marijuana, not even with the owner of the house where the marijuana was grown. Through a soft cross-examination — rather than confrontational cross-examination — of the homeowner, who gave up his Fifth Amendment right to remain silent, and testified for the prosecution, I obtained corroboration of my client’s explanation for the purpose of the marijuana growing. The police seized a lot of marijuana volume-wise, and the bags of marijuana presented in evidence by the prosecution clearly showed that had there been an intent to share or sell any of the marijuana, there was enough to go around for several people in one sitting. The defense stuck to our theory of the case at all times that the marijuana was only for my client’s own use. Well in advance of trial, we hired marijuana cultivation expert Chris Conrad to examine the evidence. He meticulously separated the many immature plants (not useable for medicine) from the mature ones, and addressed how a substantial amount of the seized marijuana was not marijuana bud (which only comes from female plants), which is what primarily provides marijuana’s medicinal benefits and drug effects. This meant that the stems, stalks, and shake that provided a substantial amount of the marijuana evidentiary volume were of no real benefit to my client. Mr. Conrad calculated that the resulting seized marijuana bud was only enough to provide a conservative dosage daily over a several-month period. David Bearman, M.D., testified as an expert in medical marijuana, including confirmation that he heavily focuses on medical marijuana as a doctor in California. Dr. Bearman reviewed Chris Conrad’s expert report in the case and heard his trial testimony, and physically examined my client before trial. He testified that marijuana provided my client with substantial medicinal benefit for the radiculopathy pain from his diabetes, and that my client’s daily dosage was very conservative. His testimony supported our theme that my client would use marijuana for pain relief, and not to get high. 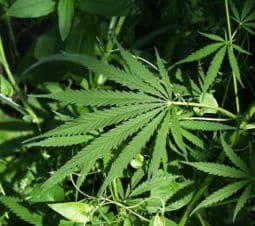 Of course, substantial risk was involved in taking this case to trial, seeing that the maximum possible penalty for the cultivation and conspiracy to cultivate marijuana counts each carried up to forty years in prison, and involved sentencing guidelines ranges starting at several months of active jail time. Taking such a risk was at once sobering and exhilarating (once we ultimately convinced the judge to convict only for simple misdemeanor possession). Ultimately, the judge found my client guilty only of simple misdemeanor marijuana possession, which carries up to thirty days in jail and a fine, which is substantially less than the decades of prison exposure for a conviction for cultivation. I anticipate that many medicinal marijuana users will continue to grow marijuana in states where it is unlawful to do so, and expect that prosecutors will repeatedly opt to prosecute such cases as felonies. Sometimes these cases can settle as misdemeanors, but sometimes only after presenting the prosecution with such compelling written expert reports as can be obtained from such experts as Chris Conrad and David Bearman when the facts support such opinions. Sometimes these cases will go to trial, where the risk of victory and defeat can be high for both sides. Many defendants will not have the financial resources to hire any expert witnesses (and their own medical doctors may fear to testify about marijuana, versus about their patient’s ailments, if they are not in a medical marijuana state), and will then need to rely all the more on presenting compelling lay testimony. A big part of defending marijuana cultivation cases is to educate judges, juries and prosecutors to focus not on the full plant volume, but on the buds that are and can be produced by the seized plants; to discount — for possession versus intent to distribute determinations — the immature and male plants, which do not supply any significant drug effect, whether for medicinal or recreational purposes; and to consider medicinal marijuana users’ interest in having an unbroken supply of reliable medicine.